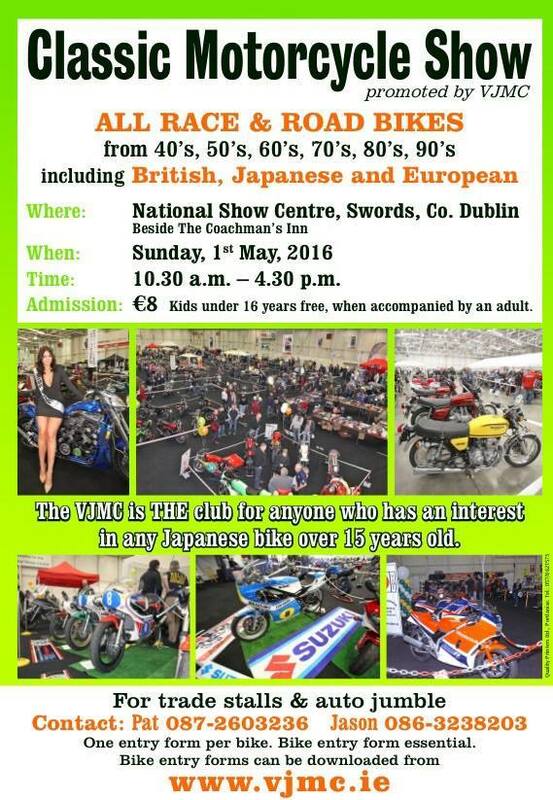 The Vintage Japanese Motorcycle Club presents the Classic Motorcycle Show at the National Show Centre, Swords, Co. Dublin on Sunday 3rd May 2015. The venue is located opposite the Coachmans pub just off the N1 North of Dublin Airport. This show is a family friendly event with something for everyone and the widest range of classic and vintage motorcycles on display from the 40’s to the 90’s. The show runs from 10:30am to 4:30pm. MAG Ireland (The Irish Motorcyclists’ Association) will be there on the day to answer your questions plus you can join up or renew your membership at the stand if you wish. Why not stop by our stand and say hello? Member or not, we look forward to meeting you! Wide selection of trade stalls, including established bike shops and small traders etc. Autojumble – for that elusive part or project! 150+ top quality classic bikes for public display. As ever, there will be a range of spot prizes on the day so don’t miss out on a raffle ticket! There’s plentiful free parking at the venue with hot & cold drinks, food etc. available throughout. Admission is €8 (children under 16 free when accompanied by an adult).